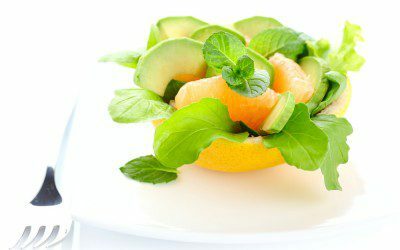 Place lettuce, grapefruit, avocado, and green onion in salad bowl and toss lightly. In a jar, shake olive oil, vinegar, and cumin together until blended. Pour over salad; toss, and serve immediately. Exchanges per serving: 1/2 fruit, 1 fat. Carbohydrate choices: 1. This recipe was developed by Sharon Palmer, a registered dietitian and freelance writer.